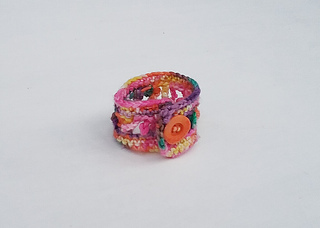 A cute cuff with a button closure. 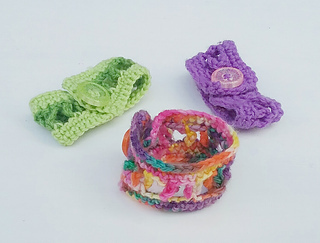 This is a quick easy crochet project that will use up little scraps. The pattern is written for small adult size, which fits both myself and my 7yr old (it is adjustable) but I have also included instructions for resizing. This pattern is Copyrighted to Kristin Wilson. Please do not distribute this pattern. You are welcome to sell items made from my patterns, but please credit me as the designer, and put a link to my Ravelry store when possible.